Enlisted Men issue olive drab wool 1917 pattern tunic has "US" and "T" collar discs, Sergeant First Class (Quartermaster Corps) rank chevron, two overseas service chevrons, honorable discharge chevron, and a nice gilt bullion embroidered on black wool 83rd Division shoulder insignia. 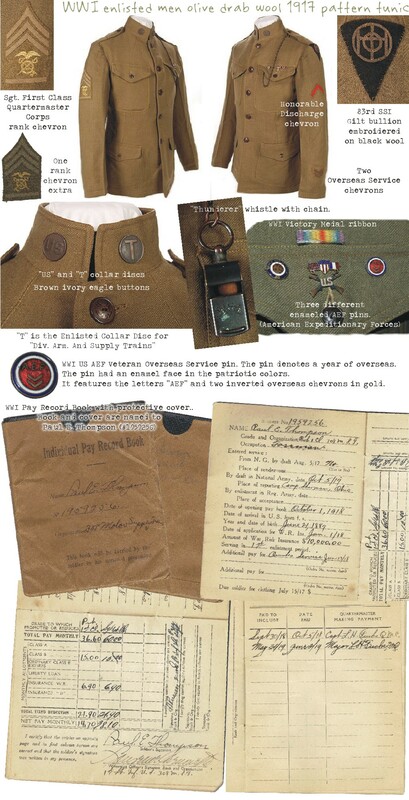 Tunic also has brown vegetable ivory eagle buttons, three different enameled American Expeditionary Forces (AEF) pins (*) and a 'thunderer' whistle on the proper chain with shepherd's hook attachment. In one of the pockets there was a WWI Pay Record Book named to Paul E. Thompson (#1959256) of the 308th Motor Supply Train, a Sergeant First Class (Quartermaster Corps) rank chevron, and a ribbon of the World War I Victory Medal. Insignia, a black triangle on which is superimposed a golden monogram of the letters O, H, I, O. Organized at Camp Sherman, Ohio, in Sept. 1917. The division was composed of drafted men from Ohio and West Virginia. First units embarked for overseas on June 4th and the last units arrived in France on June 21st. Upon arrival in France the division was designated as a depot division and was ordered to the Le Mans area. Here the division was broken up and the artillery brigade and special units, such as engineer and signal troops were sent forward as corps and army troops. The other organizations of the division were held in the area and trained as replacements for the combat divisions at the front. Returned to U.S. January 1919. The division was composed of the following organizations: 165th and 166th Inf. Brigs., 158th Arty. Brig., 329th, 330th, 331st, 332nd Inf. Regts., 322nd, 323d, 324th Machine Gun Bns., 32ssd, 323rd, 324th Fld. Arty Regts., 308th Trench Mortar Battery, 308th Engr. Regt. And Train, 308th Supply Train, 308th Sanitary Train (329th, 330th, 331st, 332d Amb. Cos. And Field Hospitals). The American Expeditionary Forces of AEF were the United States Armed Forces sent to Europe in World War I. During the United States campaigns in World War I the AEF fought in France alongside British and French allied forces in the last year of the war, against Imperial German Forces. The AEF helped the French Army on the Western Front in June 1918.